Activated Carbon Filtration | Vent Pure T | General Carbon Corp. 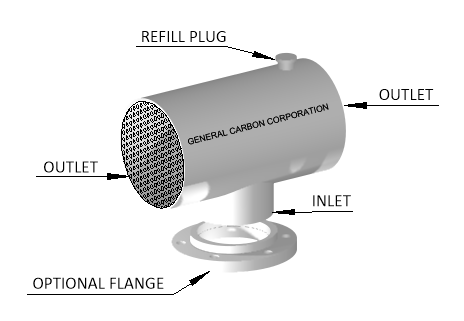 The General Carbon Vent Pure T answers the need for the control of emissions from larger vent pipes. These filters are passive units that treat gases from atmospheric vents in commercial and industrial facilities. They are made to easily slip over standard iron pipe sizes (PVC pipe too) or can be supplied with 150# flanged connections. Each filter contains 5 lbs. to 12 lbs. of activated carbon to remove problem odors. To install a GC Vent Pure-T you simply slide it over the offending pipe. When seated properly, the exhaust vapors are directed through a media bed that removes the odors. The GC Vent Pure-T is designed to be refillable. Activated carbon has a limited capacity for chemicals and when this capacity is reached the carbon must be replaced. When you notice the smell has returned. the threaded plug on the top is removed and the spent carbon is dumped out and new media is added. You can expect to replace the media in a GC Vent Pure-T every six months to one year depending on the amount of vapors it treats. The GC Vent Pure-T comes in 3 inch, 4 inch, 6 inch and 8 inch sizes standard. We can make special equipment for proprietary applications. Please call General Carbon Corporation to discuss your application needs.